(Prince Albert, Sask.) 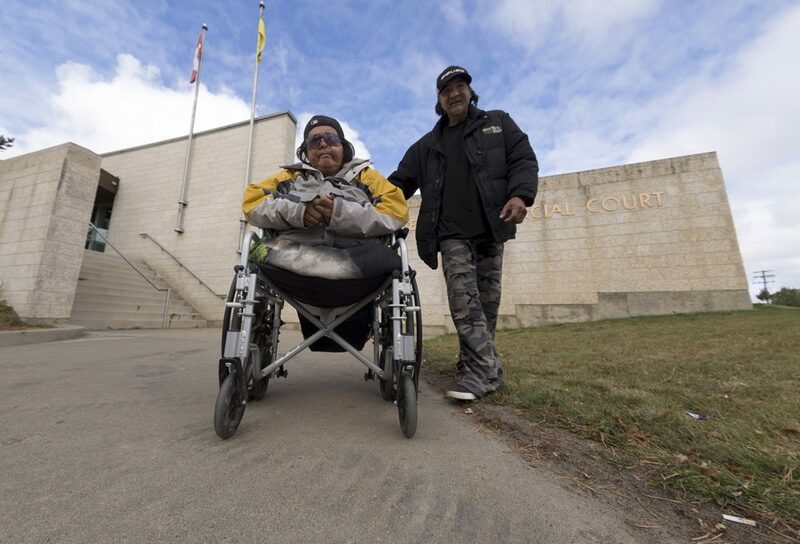 — Marlene Bird and Patrick Lavallee stand outside the Prince Albert Provincial Courthouse, where Leslie Black was sentenced to 16 years for the attempted murder of Bird. She was attacked in 2014; Bird was sexually and physically assaulted, before she was lit on fire and left to die in a downtown Prince Albert alley. The attack caused Bird to lose her legs, and much of her eyesight. Bird would pass away just months after Black was sentenced, in Nov. 2017. Photo credit Bryan Eneas. Bryan Eneas is a reporter and photographer for two news websites covering north and central Saskatchewan, and he’s also spent time as both the morning and afternoon news anchor for radio stations based out of Prince Albert, Saskatchewan. Just over one year into his tenure with paNOW.com, he became an integral part of launching LaRongeNOW.com, bringing daily news back to a region which had previously been abandoned by other media outlets. Using his photojournalism training from Loyalist College, he has helped bring quality photo and video content to both websites. Bryan has so far dedicated his journalism career to telling the stories of Indigenous people in the Treaty 6, 8 and 10 territory of Canada. As a member of the Penticton Indian Band, who in his youth paid attention to the way Indigenous people were represented in the media, he strives to change the way their stories are told in the news. Attending Loyalist College’s Photojournalism program gave me an opportunity to spend two years focusing on my abilities as a photographer, while learning how to make multimedia projects and sharpen my writing abilities. The program surrounded me with many talented photographers, writers and video producers from across Canada and around the world, who helped me grow and develop as an individual. Many of those people became some of my closet friends. Constructive and insightful criticisms from professors and peers alike has allowed me to learn and grow as a photographer. While I never pictured myself working in the news world, the photojournalism program gave me all of the skills I needed to survive in the fast-paced and constantly changing world of news. Now, I don’t know if I’ll ever be able to work anywhere else but a newsroom. I recommend the Loyalist Photojournalism program to anyone aspiring to find a practical use for their love of photography and anyone interested in getting into the media industry. This entry was posted in Thirty + and tagged Bryan Eneas, indigenous people, Loyalist College, Photojournalism. Bookmark the permalink.